How to behave in bear areas? Encounters between people and bears are a rare event in nature, as bears are cautious animals that prefer to avoid people. Despite that, we can still encounter a bear on rare occasions, especially when a bear had not realised our presence before we encountered it. Often, encounters happen in spring due to bears’ emergence from the winter dens and people visit natural environment more frequently at that time. 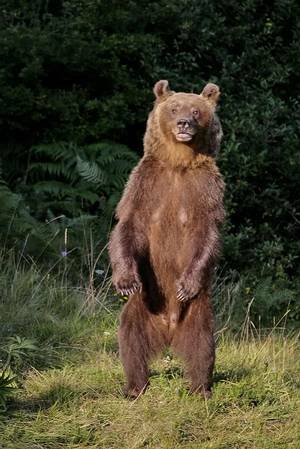 Also, in summer and autumn people are reporting on encounters with bears, as more people wander into the forest in search of mushrooms and forest fruits. When spending time in nature in bear areas it is crucial to keep in mind recommendations on how to behave there, in order to avoid unwanted encounters with bears and to ensure that potential encounters do not end up in negative consequences neither for person neither for a bear. It is important that we evaluate the circumstances of the encounter and react appropriately. A leaflet “How to behave in bear areas”, produced in the frame of LIFE DINALP BEAR project, offers detailed recommendations on how to behave adequately in bear areas. We invite you to read it through.